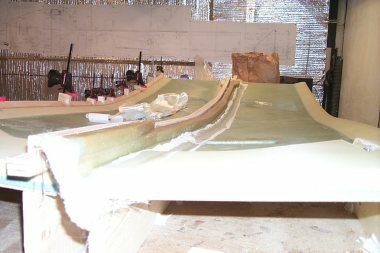 Step 4 invloves applying two layers of UNI glass to the fuselage sides and floxing the upper longeron in place. The plans state that this can be done in 3 or 4 hours. It took me eleven! This takes a long time to do by yourself. Others have done each side separately. I chose to go for it. Not sure it was a good idea. I got it done but I was exhausted. One good thing I did was to fill the epoxy pump with mostly slow hardener. This allowed me to work as long as I needed to. 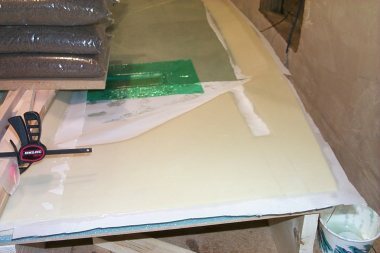 In fact I was able to take a short lunch break after applying all the micro and prior to laying down the first layer of glass. February 21, 2000. Here is the first layer of UNI in place. All the surfaces have been microed prior to this (as usual). The glass is at a 30° angle. It took three pieces. The third piece just covered the corner. While wetting all this out I discovered it was a good idea to cut the glass down the length between the longerons. This way I could tweak each upper longeron area without disturbing the other. February 21, 2000. Here is the overall layup after completion. Two layers of glass, the upper longerons in place, and peel ply in appropriate places. February 21, 2000. Here is the front end. 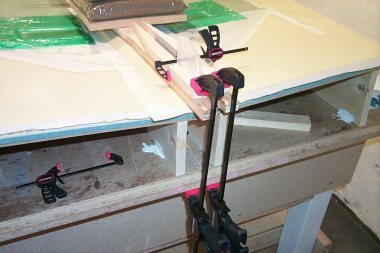 Several clamps and weights are in place to hold the upper longeron in place. 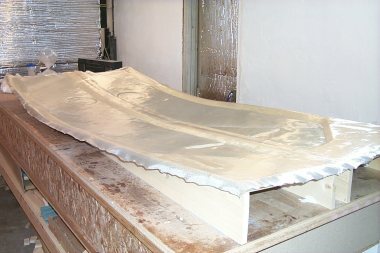 The foam below the longeron is peel plied. The area ahead of the doubler is not because it gets cut off later. February 21, 2000. 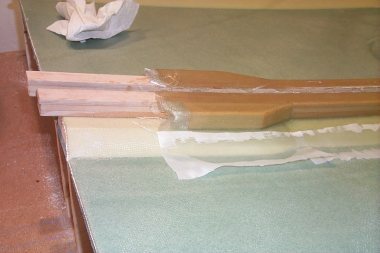 Saran wrap is used in the control stick depression to keep the glass in place better around the edges. February 21, 2000. 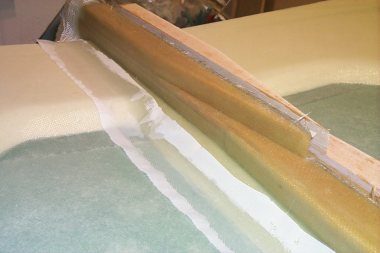 Saran wrap is also used in the fuel gauge depression to help keep the glass down properly. February 21, 2000. 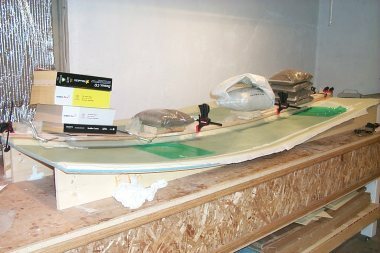 A close up of the aft end of the upper longeron being held in place. February 21, 2000. A view from the front end. February 21, 2000. 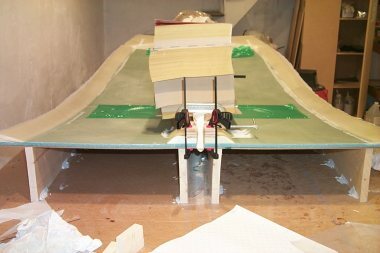 The landing gear bulkhead area is peel plied. 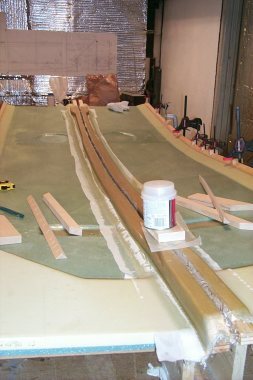 The electrical channel needs to be knife trimmed after the epoxy sets up some more. February 26, 2000. I decided to do the four layer UNI layup by doing each side separately. Trying to do both sides with one piece of glass is very frustrating as was discovered while covering the sides. Taking some measurements I decided strips of UNI that were 100" by 4.5" would work fine. 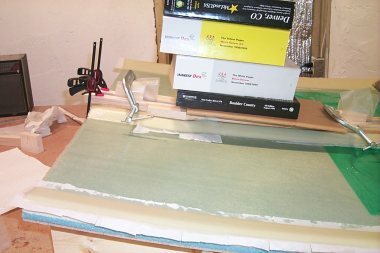 I read an idea on another builder's site about putting masking tape on the glass and cutting it in the middle of the tape to prevent strands from going every where. Sounded good. 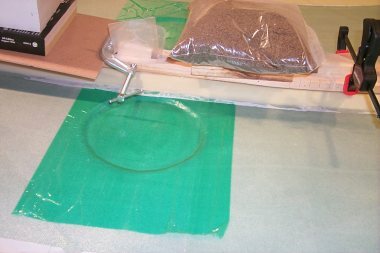 I marked the glass, layed tape full length and cut the eight strips needed for the two sides. My intent was to lay the glass in place and wet it out up to the tape. I would then remove the tape and wet the exposed edge. Wrong! Pulling off the tape made a huge mess of the strands. Quick - plan B. Luckily the glass strips were wide enough for most of the length. I decided I would just cut the glass along the edge of the tape. This would leave a nice clean edge and no strands going everywhere. Great idea except at the front and aft doublers the strip wouldn't be wide enough if I cut off at the tape. I had to remove some of the tape from each end of the strips. I had eight strips! What a pain. I removed the tape from the wet out piece then I removed my gloves and removed some of the tape from the other seven pieces. 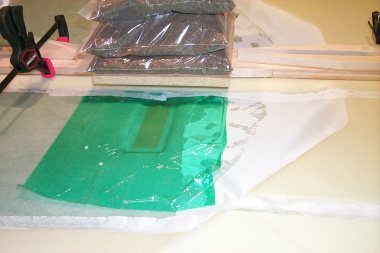 The tape idea is great as long as that edge gets cut off later after wetting out the glass. February 26, 2000. I thought this was going to be a major pain but it turned not to be. Oddly the glass, with a little help, went into place around the rear double without a lot of trouble. The glass was cut at the front end of the doubler so the glass would lay flat on the longeron and go straight up on the doubler. If BID was used or the UNI fibers weren't fore to aft then this would have been a nightmare. February 27, 2000. Here are both longerons covered with the four layers of UNI. The object near the aft end on the doubler is a little weight to hold the glass down on the taper edge of the doubler. February 27, 2000. Here is the front doubler after the four layers of UNI are added. The front of all this gets cut off later so you don't need to get the UNI all the way to the front of the longerons.